Has there ever been a better word combination than CHOCOLATE WAFFLES? I think not. 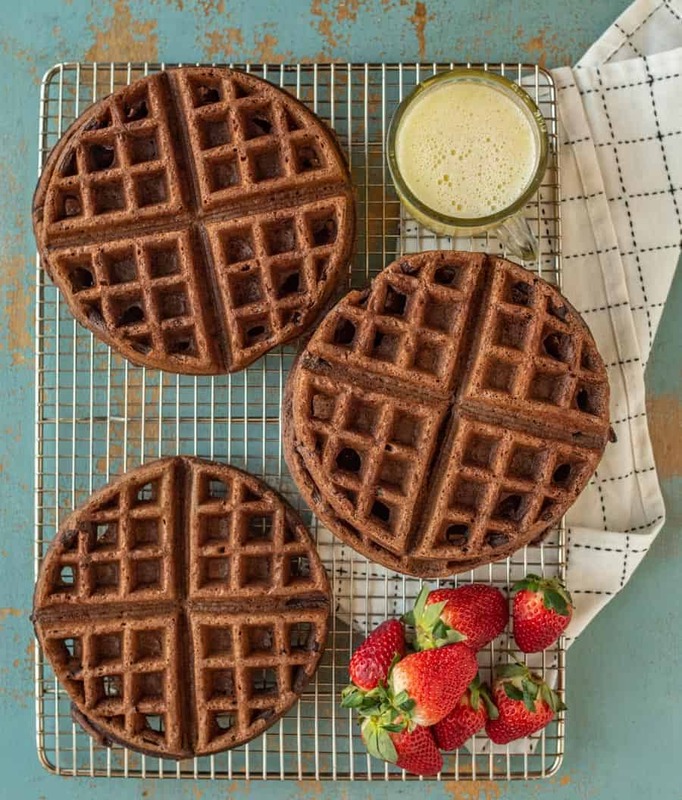 This fluffy, rich chocolate waffle recipe may seem like a dessert, but they aren’t overly sweet–making them the perfect unexpected breakfast item. I’m a big breakfast person, but you can only do so much with the usuals of eggs, toast, or granola. Don’t get me wrong–I have a mild obsession with all breakfast foods, but there’s something underrated about waffles. They don’t get nearly enough play time in the scheme of morning dishes, but this fun and funky, yet simple, recipe might just change that in your household. They certainly have in mine! Even though they’re made with cocoa powder, the sweetness isn’t too strong, so you can still top them off with all your favorite toppings. Butter, syrup, and fresh fruit are some of my favorites! What’s your definition of “healthy?” Kidding… sort of. But really, I believe homemade foods are always better to feed my family than packaged, processed foods. While these do contain sugar and chocolate, I’d much rather know what’s going into them than than not understand what’s on a pre-packed food label. In my opinion, there are no “bad” foods out there. If you enjoy a couple chocolate waffles in moderation, that’s perfectly healthy to me. How do you make chocolate waffles? This recipe couldn’t be easier! Whisk up the dry ingredients in a medium bowl before making a well in the center. Add the wet ingredients, and whisk until combined, with very few bumps remaining. 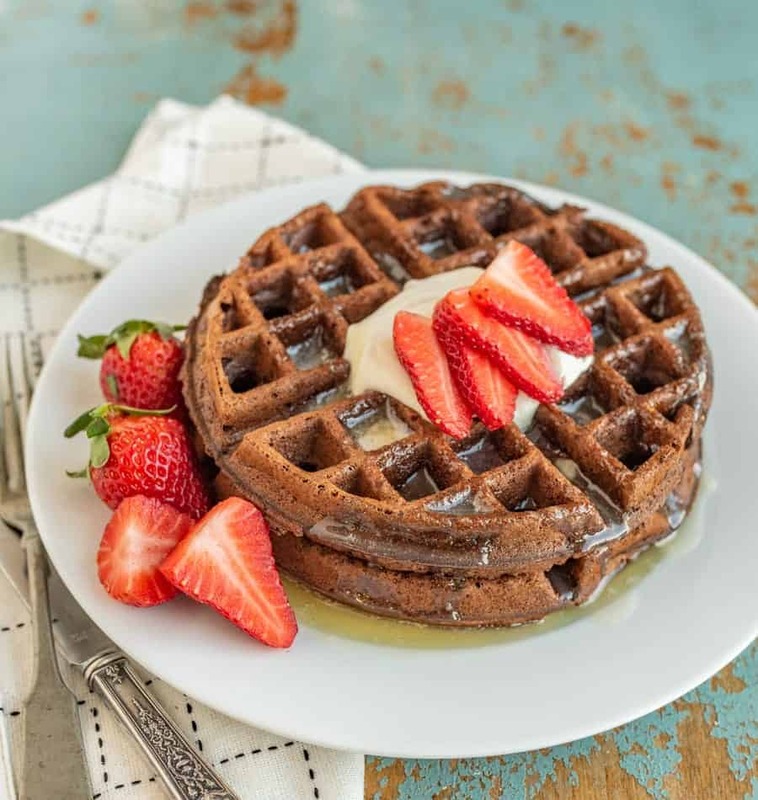 Pour a portion of the batter into a warm waffle iron, and carry on with the manufacturer’s instructions (all waffle irons are NOT created equally–be sure you don’t open yours up too soon!). These waffles are pretty minimal, but they pack a serious punch of heartiness and rich fluffiness. To make them, you’ll need to have on hand all-purpose flour, dutch-process cocoa, granulated sugar, baking powder, salt, eggs, oil, and milk. What toppings can you put on chocolate waffles? Oh, man. My imagination could run wild here. Ice cream? Candied walnuts? NUTELLA? 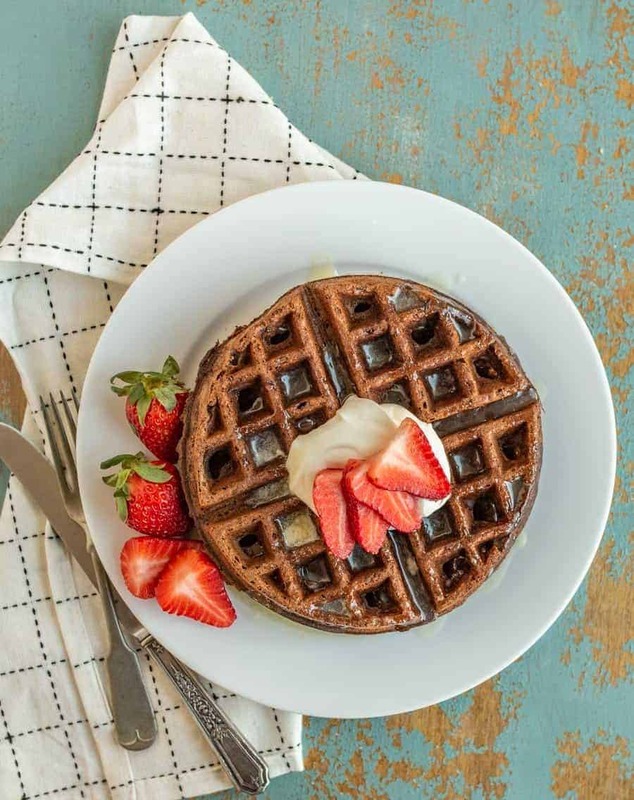 Those are just a few options if you’re feeling extra creative, but you can also stick to the typical waffle toppings: fresh or frozen berries, butter and maple syrup, buttermilk syrup, whipped cream, or powdered sugar are awesome additions. If you want a heftier kick of chocolate, add a half cup of semi-sweet chocolate chips to your batter! 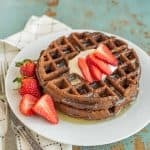 Rich and fluffy chocolate waffles that aren’t too sweet and make the perfect breakfast topped with buttermilk syrup, berries, and a little whipped cream. Preheat you waffle iron as directed. In a medium mixing bowl add the flour, cocoa powder, sugar, baking powder, and salt. Use a whisk to combine. Make a small well in the center of the dry ingredients. Add the eggs, oil, and milk to the well, and use the whisk to slowly combine the wet and dry ingredients. Stir well, until very few lumps remain. Pour the batter into your waffle iron according to manufacturers directions. When the waffle is done cooking, carefully place it on a wire rack to cool, taking care not to stack the waffles on top of each other. Repeat with remaining batter. Serve waffles hot with your favorite topping, such as buttermilk syrup, strawberries, and whipped cream. These waffles are not a sweet dessert waffle, so the syrup and berries really make them great. I would consider these a bit of a dark chocolate waffle. If you want less of a chocolate flavor, feel free to use 1/4 cup of cocoa powder and increase the all-purpose flour to 1 1/2 cups. Oooh can’t you imagine your kids faces when you make this for breakfast! I can’t wait to hear all about it. ENJOY!